Honey isn't technically vegan... I suppose it just depends on how vegan you are? There are animal rights vegans, health vegans, environmental vegans, and maybe more? I share vegan recipes for health mainly because that is the area I've done the most research in and because, as a dietitian, it is where I can help people the most! I am slowly learning more about the animal rights sector and it is a constant struggle. For now just know that these cookies use honey instead of processed sugar because honey has a few benefits for you like the fact that it is antimicrobial and antibacterial while corn syrup or cane sugar has nothing beneficial for you and can lead to sugar addiction (a totally real thing, just try getting off sugar for a week). If using honey is a problem for you then you can just as easily use maple syrup instead. Most people I know just happened to have honey in their house at all times! This cookie bar recipe is a different variation to the Chocolate Chip Cookie Bars I posted last October (link below). It is my sisters version of that recipe. She makes these ALL the time for her kids and they LOVE cookie bars. She started using honey, peanut butter, and pecans because those were the ingredients she had on hand. She can rest assure knowing she isn't giving her kids large doses of highly refined and processed sugar which can and will send them down the rabbit hole of sugar addiction. I made her version last weekend but didn't have any whole wheat flour so I used all oat flour instead and they tasted great (just needed to double the baking time)! 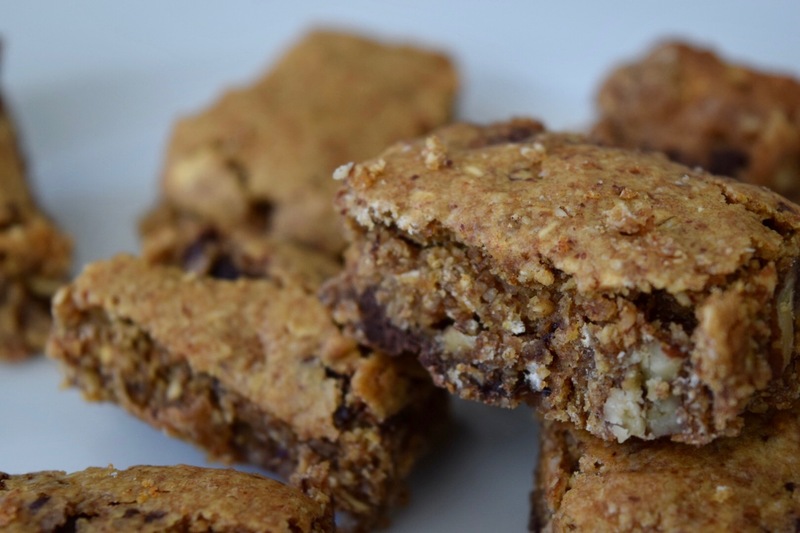 I loved making these using a different sweetener and nut butter because it shows just how versatile this recipe can be and that whatever you have on hand will do! When you need a cookie, you need cookie. So why not grab something that will nourish? Unsweetened Almond Milk anyone? Remove pits and stems from dates. Cover dates with water and soak for about 10 minutes. Lightly grease an 8×8 baking pan with cooking spray, set aside. Using a blender, food processor, or coffee grinder, blend oats into oat flour. Mix oat flour and baking soda together in a bowl. Discard water from the soaking dates and place dates in a blender or food processor with peanut butter, honey, coconut oil, and vanilla. Blend until smooth. Add chocolate chips and pecans (if you are going to toast them you can use these instructions) and mix to incorporate. Evenly spread cookie dough into baking pan. Bake for 12 minutes (if using all oat flour instead of using some whole wheat flour then bake for about 20-24 minutes), until edges begin to turn golden brown. They will look solid, but a little gooey, don’t worry you want them to look that way. You’ll be putting them in the freezer to solidify further. Remove from oven, let cool, slice into squares and immediately place in freezer. Let chill for at least an hour to set before serving. I am no longer sure where you’re getting your info, but good topic. I needs to spend some time studying much more or working out more. Thank you for fantastic info I used to be searching for this info for my mission. I am enjoying your blog and recipes. This looks yummy!